Browser firm Opera has announced that it has hit a pretty impressive milestone – 100 million people using its mobile browser software each month. Figures from the company’s State of the Mobile Web report show that 90.4 million people now use Opera Mini, and approximately 15 million people use Opera Mobile each month. In all, the Norwegian company says that 105 million people use Opera on their phones. 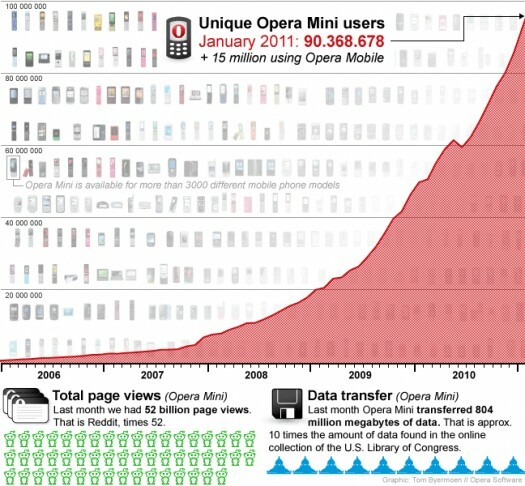 In fact, Opera says that the number is actually higher than that, as the 105 million figure only counts people who have actively installed one of the company’s mobile browser – it doesn’t count the number of users who have it pre-installed on their phones at purchase, although Opera doesn’t share this particular figure. 100 million monthly users sounds like a lot, but how does it compare with other mobile browsers out there? According to StatCounter’s Global Stats tool (not scientifically accurate, but good for getting an idea of the wider picture), Opera’s overall share of the mobile browser market fell in late 2010, rising a little during January, although it maintains its place as the leading mobile browser with 21% of the market. This is followed by the iPhone at 18.7% and Nokia at 15.2%. While BlackBerry currently holds the fourth place, current number five Android is on a trajectory that could see it hitting third place within months. For now though, Opera’s top spot seems safe and as Opera says today, it has high expectations for growth during 2011 and beyond.